North Polar® Glove is Warm & Waterproof: Protect your hands with the North Polar® glove. This insulated, hard wearing leather palm work glove is made to keep your hands and wrists safe from ordinary work hazards while working in the biting cold. If you need a warm, waterproof general purpose work glove for cold work environments, then the North Polar Glove has you covered. Need a sturdy work glove for hand and wrist protection in cold work environments? 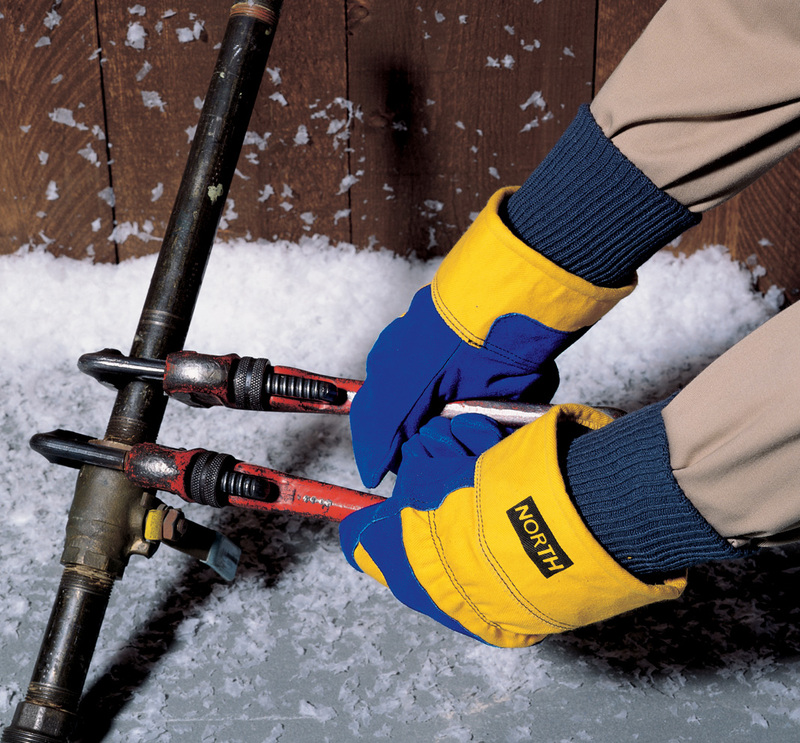 Protect your hands with the North Polar® glove by North Safety Products. This insulated, hard wearing leather palm work glove is made to keep your hands and wrists safe from ordinary general work hazards while working in the biting cold. The North Polar Glove is made of split cowhide, cut and sewn in a gunn pattern with a wing thumb and safety cuff. The extended knit-wrist provides you with additional protection along your wrist. Whether you're working in the freezer or the frozen outdoors, if you need a general purpose work glove for cold environments, North has you covered. See additional images. North Safety Products has long been a global leader in Hand Protection by offering a full, innovative line of gloves for all of your needs. North understands that there is no universal glove capable of protecting your hands under any and all working conditions, that is why we develop and manufacture a complete line of leading gloves to cover your many Hand Protection needs. To be sure that you are not using the wrong glove for your task, contact North Safety Products, or visit us on the web at www.northsafety.com. Contact North today to learn more about the North Polar® Glove. Call us toll free at 888-422-3798, or email us at marketing marketing@northsafety.com. Visit us on the web at www.northsafety.com to search for more safety products and to use our distributor locator. Thinsulate® is a registered trademark of the 3M Company.